What’s better than a super-accurate 6BR rifle? Well, two super-accurate 6BRs. This week we feature a pair of tack-drivers owned by 6mmBR.com contributor Mark Schronce. 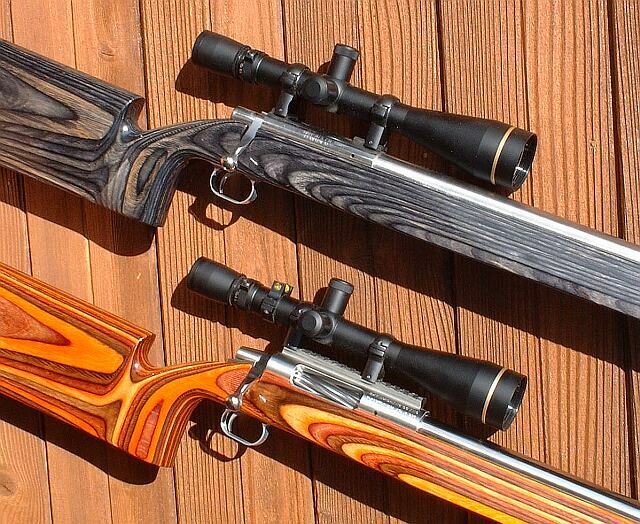 These “Brothers in Arms” share similar stocks, but otherwise the components are different. Mark’s 17-lb gray laminate Light Gun features a Hall action, HV taper barrel, and muzzle brake. The 21-lb Heavy Gun, in “Desert Camo” laminate, boasts a trick dual-port BAT action, and full-contour 30″ barrel without brake. Both guns shoot tiny groups, track like they’re on rails, and give Mark a serious hardware advantage in club competition. Mark provides this report: “The Light Gun started as my 22-250 AI varmint gun, with a Hall action and McMillan Hunter Benchrest stock. I wanted to build a proper Egg Shoot gun, so I had Richard Franklin (Richard’s Custom Rifles) chamber a Lilja 12-twist in 6mm BR Norma, with a .262″ neck. Using Fowler 80gr FB bullets, the gun shot great right out of the gate. (See my report, Egg Shoots and 600 yd 6 BR). I was curious about the heavier 6mm bullets, so I had Richard chamber and fit a 1:8″ Krieger in 6BR. But this time we went with a .271″ no-turn neck. The Krieger holds quarter-MOA with the heavy bullets, and, to my surprise, it shot the 80s as well as the 12-twist Lilja did. For the 2005 season, I ordered one of Richard’s latest 008 F-Class stocks. This new design is very comfortable to shoot and it’s much more stable in the bags than my old Hunter stock. That added stability will be a big plus for 600- and 1000-yard benchrest matches. I’ve been active in 1000-yard Benchrest for a few years, shooting my 6mm BS and 6mm BR Light gun in both Light and Heavy classes. I wanted to build a rifle for the Heavy Gun Class yet stay within the 22-lb F-Class limit. And I wanted it to have the best hardware I could buy. 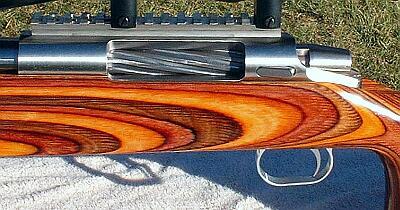 On a BAT ‘MB’ action (with Jewell trigger) we fitted a 30″ 8-twist 3-groove Lilja, 1.250″ diameter, no muzzle brake. Richard cut the chamber for 6mm BR Lapua Brass, .271″ no-turn neck, throated for Sierra 107gr MKs, matching my current Light Gun. The stock is a pillar-bedded Richard’s 008 1000-yd/F-Class model, with 10 coats of auto clearcoat, all work by Richard. Burris Zee rings hold a Leupold 8.5-25×50 LRT mounted on a BAT one-piece Weaver base. The Heavy Gun weighs in at 21 lbs, much lighter than most Heavy Guns (50 to 100 lbs). But with the 6BR’s light recoil, it’ll do just fine for long range, yet still make weight for F-Class. Why a 6mm BR Chambering in a Heavy Gun? I toyed with the idea of going with a 6BR Improved for Heavy Gun, but I’m not convinced the Improveds are worth the extra hassle of fire-forming, not to mention the added cost of custom dies. By way of background, I used to have a Rem-actioned rifle chambered in 6BR BS (Bill Shehane), which is very similar to the 6BR Dasher. I found the 6BR BS was only about 100 fps faster than a standard 6BR. For the shooting I do, that extra 100 fps is not critical. If, in the future, I feel I need more speed, I will go to a .243 AI or a 6.5-284. To be honest, I love the 6BR cartridge. Barrels last forever, and the accuracy can’t be beat. Yes a 6BR is a little light for everyday 1000-yard shooting, but on good days it can set world records. I may move up to a 6.5-284 some day, but for now I will stay with the standard 6mm BR. If I ever do want to go to a bigger caliber, the 8.5-inch BAT Machine MB action gives me this option. Comparing the two actions’ bolt lift, lock-up, fit, and finish, I feel they are equally good. However, the BAT can run stout loads with Federal 205 primers — loads that cratered Fed 205s with the Hall. I don’t know if this is a function of the actions’ engineering, or the barrels. I’ve got a Lilja on the BAT, while the Hall wears a Krieger. I do know the BAT has a tight-fitting firing pin, and that might make a difference. Both my actions have a built-in recoil lug — a really nice feature when you are changing barrels, and one of the main reasons I favor custom actions over a Remington. I think anyone would be pleased with either the BAT or the Hall. There is a big difference in shooting a Light Gun vs. a Heavy Gun, as you might expect. The Heavy Gun is more stable and recoils straight back. However, even at 21 pounds, the Heavy Gun actually recoils harder into your shoulder than the muzzle brake-equipped Light Gun. But if you take the Light Gun’s brake off, and put the action back in the old Hunter bench stock, the gun would jump, torque and roll. It’s much better with the 008 stock now, but still not as rock solid as the Heavy Gun. On recoil the 21-pounder just tracks straight back, no jumping, no yaw, no rolling–very impressive. Developed last year, my favorite Light Gun load is 30.5 grains Varget, CCI BR4 primers, and 106gr Clinch River VLDs, running 2825 fps. The Light Gun shoots other bullets very well, but the Clinch Rivers performed best, with groups in the 0.1s to the low 0.2s at 100 yds. I use Lapua brass of course. I began my load development for the Heavy Gun with components I had from last year: Varget, N140, and N540 powders, plus Fed 205, CCI BR4, and CCI 450 primers. I also had a good selection of bullets: 95gr and 105gr Bergers, 105gr Lapua Scenars, 106gr Clinch Rivers, and 107gr Sierra MKs. The Heavy Gun liked the Bergers right from the start. During break-in and fire-forming (with 95gr Bergers 0.20” into the lands, 30.0gr Varget and CCI 450s), the rifle shot in the low 0.2s at 100 yds, 0.3s at 200 yds, with a 0.182″ small group at 200 yards (see photo). I then moved up to the heavier bullets and again the Bergers stole the show. 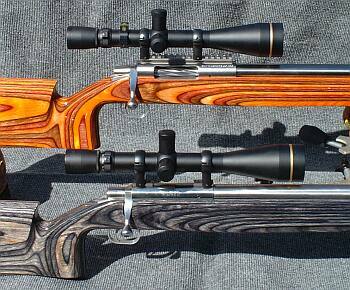 Best load for the Berger 105s (seated 0.15″ into the lands) was 30.5 grains Varget and Fed 205s at 2850 fps. 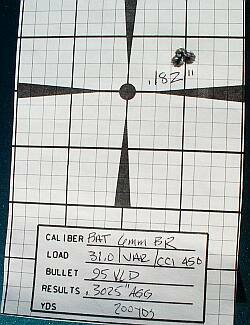 At 100 yards, this recipe shot in the 0.1s to the low 0.2s with a small group of 0.089″. (By the way, this same load in my Hall Light Gun would crater the Fed 205 primers. I may have to change to CCI BR4 primers for the hot summer days.) After working with the 105s I wanted to see how the Heavy Gun performed with lighter bullets. I tried my favorite Egg Shoot and 600-yard load–80gr Fowlers pushed by 31.5 grains of Vihtavuori N135 with Fed 205 primers. The results were fantastic. The big BAT produced a 100-yard aggregate (five, 5-shot groups) in the 0.2s with an 0.129″ small group. Overall, at 200 yards, both guns could agg five 5-shot groups in the 0.3s and 0.4s. Eggs Beware! I looked at all the custom actions, and decided on a BAT model ‘MB’, configured Right Bolt, Left Port, Right Eject. The ‘MB’ action has some pretty unique features, including an integral recoil lug on the underside, and a recessed tenon (i.e. the threads start 1″ from the front of the receiver). The action is 8.5″ long, but with a 7.5″ bolt. The extra inch is added to the front. That provides extra bedding surface and room for a third pillar. The 8.5″ action length gives me the option to go up to a 6.5-284, while the dual ports should help give me the speed I need for the 10-round strings in Heavy Class. Also I can load from either side for F-Class. Why did I choose a BAT? First, BAT quality is second to none. Moreover, BAT will custom-configure your port(s) and bolt for the same price, no added fees. Other action-makers charge extra for anything other than your basic Right Bolt, Right Port. 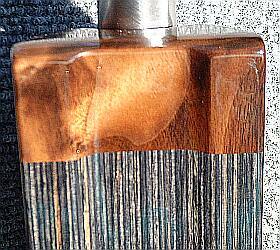 This makes the BAT about the same price as a Stolle or Nesika, if you want a set-up like mine. The right-side ejection port is slightly smaller than the left feed port, but I can still feed 6BR cases from either side if I wish. The MB action is so big, the little BR case runs out of ejector as soon as the case leaves the chamber, so I push the case out to the right as I load the next round from the left. The BAT will eject a loaded 6BR round just fine, but a fired case only ejects sometimes. This action would work great with a longer round, such as a .243 AI or 6.5-284. If you want completely reliable 6BR ejection, you’ll need a smaller BAT action. But then, like my Hall standard action, the port would be too small for a 6.5-284. The 008 stock is the best design I’ve ever shot off the bench. I like to hold my guns, and the 008’s grip profile gives me the control I like. The trigger is close enough for my short fingers. The underside of the buttstock is flat and completely straight (parallel to the barrel), so the gun tracks straight back. During recoil, the scope stays on target, making for quicker recovery time. In the picture at left, you can see that the underside of the fore-arm is relieved in the middle with raised strips on the left and right. These “rails” make for less surface area contacting the bags, less friction, and more consistent recoil. The high comb on the stock allows better prone shooting. For now, the stock is fine for what prone shooting I do. But if I do get seriously into into F-class I may want to add an adjustable comb or cheekpad. We’ll see. Next month (March 2005) will be my first 600-yard match this season. I can’t wait to see how this pair perform at long range. I will also take the Light Gun to the big Hickory GroundHog match in April, but I may put the barreled action back in the Hunter stock. This year you have to use bipods or sand bags, no front rest. I don’t know if want to drill into my pretty new 008 stock for a bipod mount. I’ll let you know how it goes, and hopefully I’ll come back with some loot from the Shoot. This year Hickory is offering about $8000 worth of prizes. Topics: 6mm, 6mm BR, 6BR, 6BR BS, 6.5-284, Lilja, Krieger, Shilen, 1000 yards, IBS, NBRSA, Egg Shoot, Ground Hog, Varmint, Varminting, Roanoake, Jewell trigger, Benchrest, BR, Bench Rest, Single-shot, competition, rifle accuracy, Norma, Hodgdon Powder, Varget, Vihtavuori, N150, N540, Berger, Lapua Scenar, Richard’s Custom Rifles, 008, F-Class, stocks, McMillan, BAT Machines, Hall Action, stainless barrel, reloading, powder, case forming, Neck-turning, .262, .271, No-Turn, Lapua Brass, Clinch River bullets, precision.